InstallAware is the easiest install builder available today. It completely isolates you from all aspects of Windows Installer databases while generating fully logo compliant, pure Windows Installer setups. start saving money today BUY NOW! If you are looking for an easy to use install builder, InstallAware is your best choice. It lets you rapidly build your MSI based installation using its visual IDE pages. When you need more power, you may switch to the code view, and precisely craft branching execution logic for your installation. 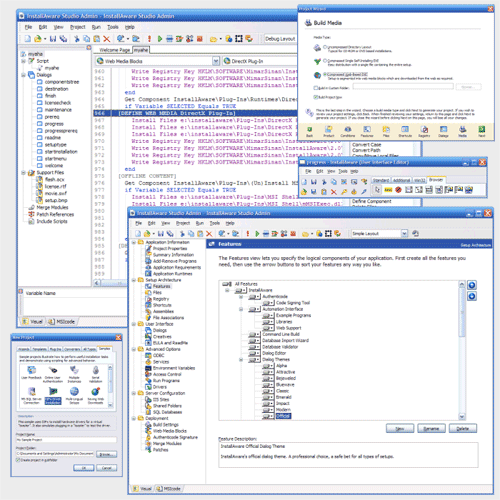 Both the code and visual views are always integrated - changes you make in one view will always be visible in another, allowing you to rapidly prototype your setup programs in the revolutionary two-way integrated IDE. What's best, InstallAware is the only install builder that offers you Genuine Scripting for Windows Installer. Read more about this unique technology and how it cuts down your development time. Click here to download our install builder technology whitepaper (available as a PDF file) or Download Your Free 30 Day Trial today!